Mexico City (1) No eyes on the street at megacity core? Which is the biggest city in the world? Hard to tell; take a bunch of five geographers from different countries in front of the same territory, and chances are you will get five different limits maps for that same area. It is hard to know whether the largest city in the world is Tokyo, or Mexico, or Delhi, as you should begin by defining precisely what being a city means at such scales (UN criteria can be questioned). What seems clear is that the biggest city (in any sense) of the Spanish-speaking world is Mexico. As in other cases, again a city I have never set a foot on (so I thank any comment, especially from my Mexican readers). The country can be seen from Spain with mixed sensations: curiosity for such a culturally complex country, a degree of caution regarding an image of violence and inequality, astonishment due to the dimension of the problems, and interest for a society that seems to be evolving. This stroll will use as a guide a set of city block files from INEGI that have associated data and have led me to ask some questions. The first image shows most of the blocks of what can be defined as the (more or less) continuous city. 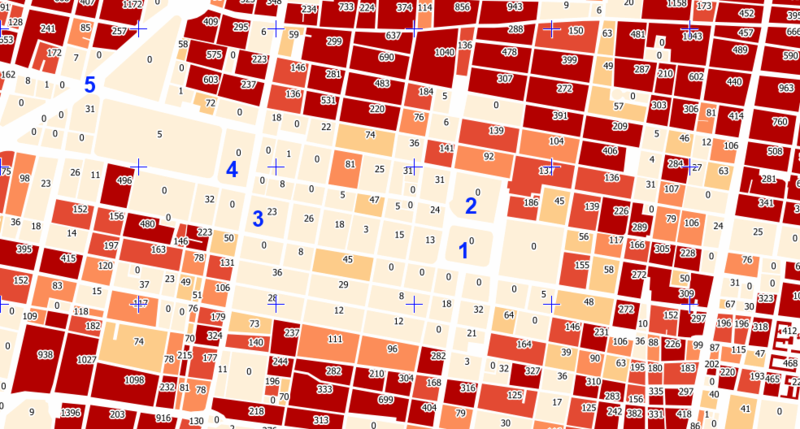 Blue hues correspond to blocks in Mexico State, red being for those in the Federal District; color intensity increases with the population of each block. The graphical scale illustrates the spatial magnitudes of this, for a city that in 2010 had some 20 million residents according to INEGI. 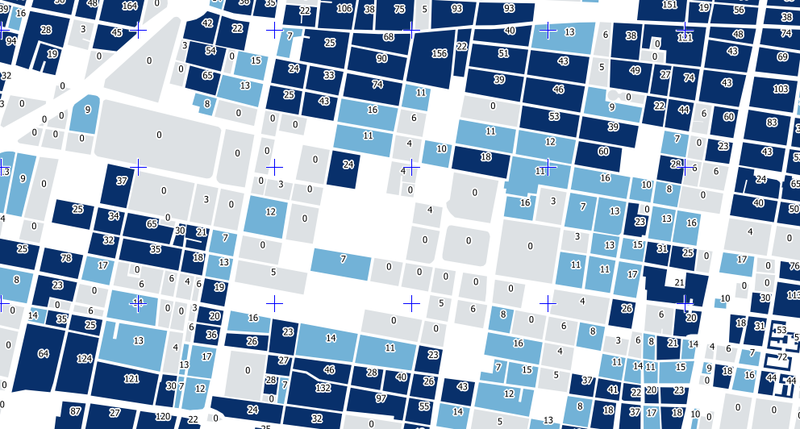 The second image shows the symbolic city core; blue crosses are separated 500 m in each direction. Here are the Zócalo square (1), the Cathedral (2), the Torre Latinoamericana (3), the Palacio de las Bellas Artes (4) and the Paseo de la Reforma (5). 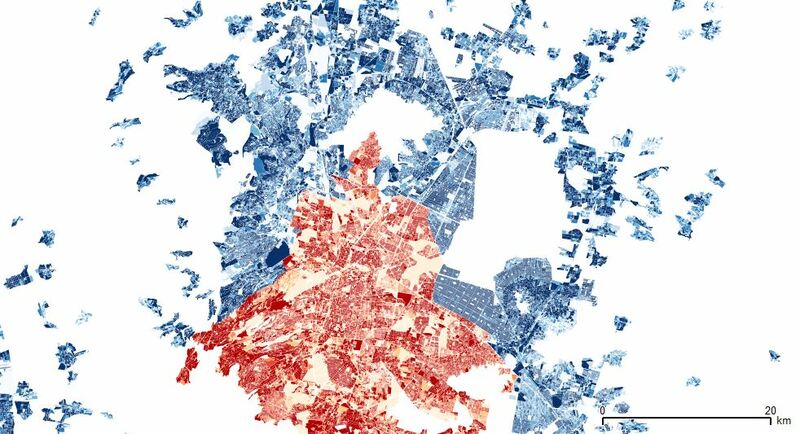 Red hues are proportional to the population of each block, written on each of them. 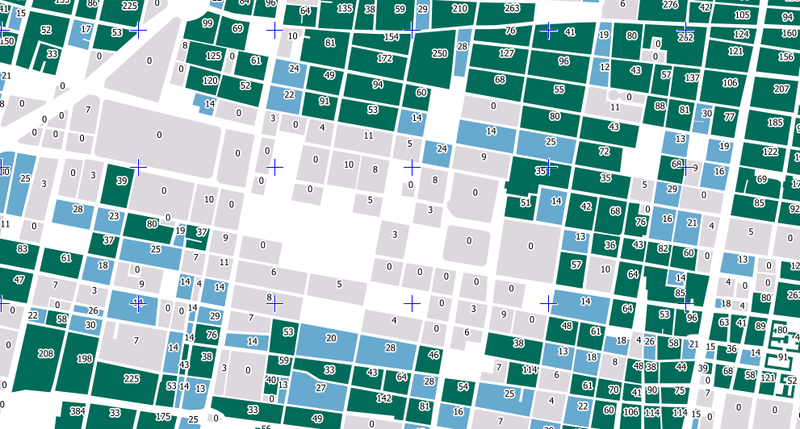 It is surprising to see that this area, with 220 blocks, has a population of just 68.000 on 4,5 sq km, a density (150 per hectare) which seems rather reduced for an urban core; the figure seems justified by retail and office uses, but not due to an increasingly older population, as in other urban cores (see the following images). The midterm impact of recent measures as the conversion to a pedestrian configuration of calle Madero, which is positive for mobility and security, should be positive, but remains to be verified in terms of local demography.